If you answer “Yes” to several of these questions, talk with your child and pediatrician. Does your child skip family meals and prepare her own food instead? Is she following her own diet? 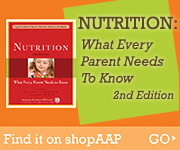 Are certain food groups or nutrients categorically excluded? Are no- or low-calorie foods and drinks a major part of daily intake? Has she adopted a “healthy” vegetarian diet suddenly and obsessively? Are diet pills or preparations in her possession? Is she overly concerned with losing or gaining weight? Have you found laxatives that you did not give her? Does she hide food in her room? Does she visit the bathroom after eating? Does she flush the toilet, run water, or turn on the shower while in the bathroom? Has your plumbing repeatedly and inexplicably become clogged? Does she have an unusual number of scratches or cuts over her knuckles? Does she have swollen cheeks or lymph nodes around her face, or broken blood vessels in the whites of her eyes? Has she lost a lot of weight in a short time? Does she get dizzy or is she easily fatigued? Does she have frequent headaches, heartburn, or constipation? Does she play with her food without actually eating it? Has she developed downy hair on her face, arms, and back? Can you see the bones of her back and collarbones clearly outlined? Does she have bruises along her backbone? Does she wear loose, bulky clothing? Does she exercise for hours on end with a routine that can’t be interrupted or changed? Has she become withdrawn from her friends or family? Does she seem more secretive?